Diagnostic Questions offers over 2000 quick questions for an immediate and accurate look at student understanding of math concepts. Choose the question link to browse and find questions by topic. Choose "Random Question" for one question on any topic. Each question offers multiple choice answers and checks for the correct response. View each response to find out how many others made that choice. Optional site registration allows you to assemble collections of questions into quizzes to save and share. Use the online editor to create and share your own quizzes and questions in just seconds. The site was created in the UK, so it has some pronunciations and spellings different from American English. Use this site as an anticipatory set or "activator" to introduce a unit or lesson on a projector or interactive whiteboard. Use to find a question of the day to begin lessons. Share or embed questions on your class website. 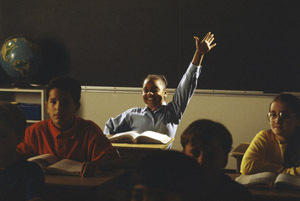 Have students prepare a question of the day to include with your quizzes. See the "About" page to find questions for class discussions. Though they suggest using mini whiteboards or a large card, think about using computers or tablets and a student response system, such as Socrative, reviewed here. Using a student response system, you will be able to keep a record of the responses without having stacks of paper. It will help you to differentiate and know whom to focus on with some immediate extra help. Practice spelling a new way with Spell Up. This activity requires the Chrome browser. Allow your computer's microphone to connect to the website to begin. Choose from beginner, intermediate, or expert level to play. After hearing the word to spell, say a letter and wait for it to appear and continue on until the word is completely spelled (wait to speak when you see the orange dot). Correctly spelled words become part of a tower of words. Incorrect words fall off the screen with the opportunity to try again. Options within the game include a dictionary to hear the definition of words, a keyboard to hear letter pronunciations, and a translator to translate words into many different languages. Demonstrate HOW to use this website on your interactive whiteboard or projector (with your mike nearby!). Divide your class into teams and test out the site together. Create a link to Spell Up on your class website or blog for students to play at home. Use Spell Up at varied levels for different students to differentiate challenges for your students. Share this link on your class website for students to use at home (especially for spelling practice during the summer). Fill in the Chart helps you practice multiplication facts using multiplication charts with missing numbers. Choose from many different versions of the charts such as the 5's or 10's facts. When finished, choose "Grade Me!" to view your score. These practice activities are untimed (so less pressure). Other practice charts include quizzes with multiplication facts offered in random order. Choose from many different practice options. Share Fill in the Chart on your class website or newsletter for multiplication practice at home or from any computer. Create a link on classroom computers for student practice during center time. Differentiate learning by assigning different practice charts based on individual student needs. This site doesn't time students, therefore causing less stress. if you prefer, have students time themselves with each activity then challenge them to improve completion time and accuracy with each practice. Or time your students using the free Online Countdown Timer (reviewed here). Practice and improve student skills in the K-8 curriculum with MobyMax. Start with pre-testing students and assigning differentiated activities for reading, math, science, writing, grammar and vocabulary. Pre-tests target areas of struggle and assign curriculum based on need. Never again will students have to practice material they have already mastered. The progress tracking throughout is based on Common Core standards. Adjust assigned curriculum on your own if desired by reassigning a pre-test or assigning your own lessons. Register using your email and school information to begin. Add your student list. Once created students have their own individual login to begin placement testing. There is a PRO account that costs money; this review is only for the FREE portion. Create a classroom account. Use MobyMax during centers, for nightly homework, or computer lab time. Share with parents as an excellent resource for practicing math, reading, writing, grammar, science, and vocabulary skills at home. Use the pre-testing features at the beginning of the school year to get students started at the correct levels. Use this tool to differentiate for all students. Your gifted students can pretest out of material already learned and receive activities and instruction at their individual level. Be sure to bookmark this site to use with all levels of students. If famous people from long ago had inboxes, what would be in them? Famous Inboxes takes that concept and creates inboxes for characters in literature, entertainment, and history. Choose from artists, musicians, great leaders, authors, and many more categories. Each inbox contains a screenshot of the person's email (mythical) inbox including the subject of the email and the sender. This is an entertaining and provocative site sure to inspire lots of ideas for your own use! Be sure to preview before you share as some of the topics (or "texting" language) may not be appropriate for the classroom. Share Famous Inboxes with your students on your interactive whiteboard or projector using a character or author studied in class. Assign students to each of the inbox titles and have them write the actual email sent. Don't see anyone to use in class? Create your own or have students use the site as a model to create their own. Most likely, working in groups will get the creative juices flowing. This would be a great model to use for introducing a history or science unit or for looking at the relationships between characters in literature. Have students write the emails as an end of unit review. Subscribe to the RSS feed of this site to receive updated contents. Use the option to create an inbox as a differentiated challenge for your gifted students. For example: Summarize World War II by showing Winston Churchill's inbox, then write two of the key emails. As a "hook" for new books in the media center, have students create inboxes for one of the characters and post them with the book jackets. Instead of a "report" on a scientist, have students create their inbox documenting their research and accomplishments.